Siesta Key Holiday divides our little 8 mile long island into 5 main areas to assist in finding Vacation Rentals in the location that you desire. Being directly on Siesta Beach (or the southern part called Crescent Beach), is where everyone wants to be. By renting right on the beach, there will no traffic filled roads to cross, and the chance of a beautiful direct Gulf of Mexico view. (But of course be careful if you're really looking for a great view, to make sure you'll get one, because not all of the units on Siesta Beach actually have a Gulf View). The main disadvantages of being right on the Siesta Beach can be the crowds, the noise, and the expensive rental rates. All the rentals in this area are very close to Siesta or Crescent Beach, in many cases right across the street, or a short walking distance to the Beach. (You will have to across Midnight Pass Road (or) Beach Road, but there are safe crossing areas. The advantages of being slightly away from the Beach include lower rental costs, and perhaps larger Rentals. There tend to be many private rental homes that may offer many advantages that you cannot get in a Beach Condo Resort, adventages like a private backyard with grill, closer parking, perhaps a larger home, and MAYBE the owner will allow PETS. Siesta Village is the fun "downtown-like" area of Siesta Key. All the best Bars and Restaurants are there, and eveything else you'll ever need, like a Drug Store, Post Office, and Souvenir Shops. And the great advantage of staying in this area is you can forget your car, and walk to everything, INCLUDING SIESTA BEACH! The advantages of being slightly away from the Beach include lower rental costs, and perhaps larger Rentals. There tend to be many private rental homes that may offer many advantages that you cannot get in a Beach Condo Resort, advantages like a private backyard with grill, closer parking, perhaps a larger home, and MAYBE the owner will allow PETS. Located just 4 miles South of Siesta/Crescent Beach, Turtle Beach is the favorite hangout for locals. It brings back "old Florida" with Green Parrots squawking in the palm trees surrounding a perfect Lagoon (Blind Pass Lagoon) for kayaking, fishing, or boat launching. Turtle Beach itself was completely re-nourshed in 2016 and is some 200 Feet wide, and goes on "forever" South. There are kids swings, picnic tables, and grills for that old-fashion picnic under the shade of the trees. Advantages include a much less crowded Beach and great Beach fishing. There are only 2 Resort Condos located on Turtle Beach, and they both have some of the very best "Gulf Views" available on all of Siesta Key because they look directly at the Ocean that is only about 200 feet away. Another advantage is the slightly lower cost of direct Beach Front rentals there. 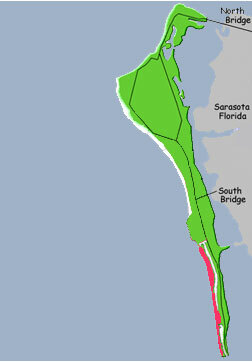 A disadvantage of Turtle Beach is that it does not have the "Sugar White Sand" of Siesta/Crescent Beach, but more "normal" sand of many Florida Beaches. TIP: Often renters will stay at Turtle Beach to avoid the crowds and get the best Ocean View, and drive up to Siesta Beach an afternoon or two to try it out. The advantages of being slightly away from the Beach include lower rental costs, and perhaps larger Rentals. There tend to be many private rental homes that may offer many advantages that you cannot get in a Beach Condo Resort, adventages like a private backyard with grill, closer parking, perhaps a larger home, and MAYBE the owner will allow PETS. This narrow "bottom" area of Siesta Key has very limited traffic, and almost everyplace is only a 4-8 minute walk to Turtle Beach. There are some "spectacular" rental homes located directly on the Bay that offer some of the best "water views" on Siesta Key! Sarasota is one of Florida's premiere cultural cities, as well as the original "Home of Golf". Sarasota features 3 barrier off-shore islands, all with Beaches, Longboat Key, Lido Key, and Siesta Key. All different and all great fun! 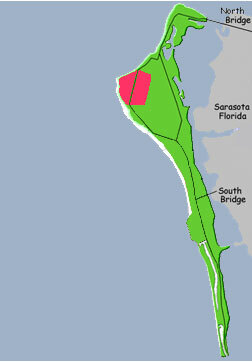 Sarasota has many Golf Courses, all relatively close. 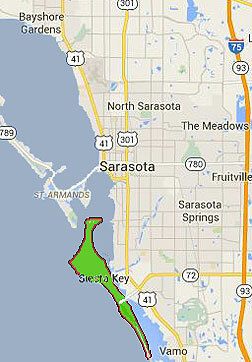 Sarasota itself is only about 6 miles from Siesta Key, 2-3 miles from Lideo and Longboat Keys. 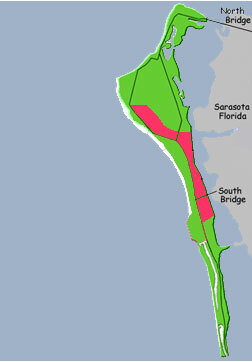 So by staying in the Sarasota area, you have access to multiple Beaches or Golf Courses, only a very short drive away! All Material Copyright © 2012-2017 SiestaKeyHoliday.com. All Rights Reserved.